Fatigue can kill productivity and increase the risk of injury. Scissor lifts and Pallet Positioners reduce fatigue, increase productivity, and decrease the risk of injury. We know that most all applications are unique. 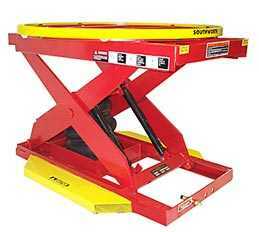 There is a scissor lift or pallet positioner that will apply to your application. Our professional personnel can assist in selecting the right lift for your application. Our professional material handling equipment installers can properly perform your scissor lift installation as well. If you do not see specifically what you are looking for Contact Us, we are here to assist you. Request a quote and put our professional personnel to work for you. We also offer other equipment to mover product vertically such as Conveyor, Vertical Lifts, and Dock Lifts.